Jan. 30, 2019 – ZURICH, Switzerland — World-renowned stem cell researcher and founder of Blue Horizon International (BHI) and BHI Therapeutic Sciences, Inc. (BHITS) Brian Mehling, M.D. attended the World Economic Forum in Davos to discuss his cellular and regenerative medicine studies and research at the Jan. 22-25 annual meeting in Davos-Klosters, Switzerland. 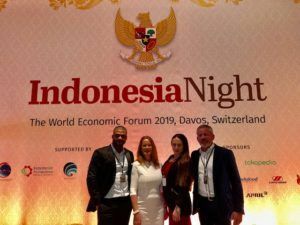 More than 40 heads of state and government, as well as 3,000 participants drawn from all over the world and from every sphere of influence: business, government, civil society, academia, arts and culture, and media convened at the 49th annual meeting. “BHI Therapeutic Sciences, Inc. (BHITS) conducts research to support commercialization of stem cell technology to support regenerative medicine. Stem cells are a multipotent human cell that have the potential to support regenerative repair of the human body. BHITS is developing a stem cell technology to support regenerative repair with the intent of avoiding surgery as a final option,” said Dr. Mehling. “BHITS believes stem cells possess the potential to treat various diseases, to extend lifespans and to improve the quality of life for certain patients,” he added. Dr. Mehling was joined by Klara Doert, General Manager of International Business Development, Katarina Novakova, MSc., President of BHI Slovakia and Alan Da Silva Pereira, President of BHI Brasil. 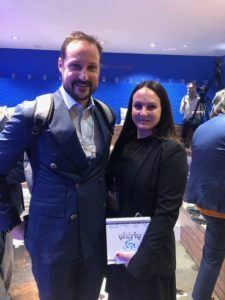 Ms. Novakova was nominated for the WEF Young Global Leader, Class of 2019. Klaus Schwab, Founder and Executive Chairman of the World Economic Forum, created the Forum of Young Global Leaders in 2004 as a way to help the world meet increasingly complex and interdependent challenges, as a community of enterprising, socially minded leaders working as a force for good. After WEF, Dr. Mehling travelled to Slovakia to visit the BHI Slovakia treatment and research facility in Malacky, approximately 1,5 hour drive from the Vienna International airport. By strategically placing their clinic in Slovakia, located in the heart of Europe, the most innovative treatments within the stem cell field are available for the global market. Blue Horizon International is a healthcare consulting company with a unique mission that combines treatment, research and philanthropic efforts. BHI Therapeutic Sciences, Inc. (BHITS) conducts research to support commercialization of stem cell technology to support regenerative medicine. BHITS is developing a stem cell technology to support regenerative repair with the intent of avoiding surgery as a final option. BHITS believes stem cells possess the potential to treat various diseases, to extend lifespans and to improve the quality of life for certain patients. For more information please visit Blue Horizon International at www.bluehorizoninternational.com. 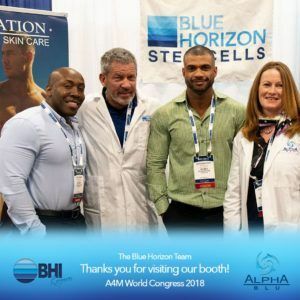 BHI Therapeutic Sciences (BHITS), BHI Rejuve, and Alpha Blu Skin Care participated in the 26th World Congress on Anti-Aging Medicine & Exhibition in Las Vegas, December 13-15, 2018. Prominent, influential, and notable leaders in healthcare delivered keynote presentations at the 26th Annual World Congress: all of which were focused on the critical need for both innovation and transformation in medicine. The speakers represented the continual effort to redefine and reshape medicine, and inspired attendees to commit and contribute toward a new century of wellness and longevity. Brian Mehling, M.D., chief medical officer of BHITS was joined by Klara Doert of BHI Germany; Alan Pereira of BHI Brazil; Fidel Desmar, Brandon Pope, and Katarina Novakova of BHITS, USA. “Blue Horizon Rejuve program is the latest initiative of BHITS. It focuses on rejuvenation and anti-aging of the human body, with the help of a complex of vitamins, hormones and stem cell therapy,” said Dr. Mehling. “The anti-aging part of BHITS activities is only one component. Its program is more complex and offers advanced stem cell therapy to patients worldwide,” he added. BHITS also maintains a special emphasis on charitable work, giving back to the local communities. For more information on our charitable work, please visit www.bluehorizonfoundation.org. The American Academy of Anti-Aging Medicine, Inc. (“A4M”) is a non-profit medical society dedicated to the advancement of technology to detect, prevent, and treat aging related disease and to promote research into methods to optimize the human aging process. A4M is also dedicated to educating physicians, scientists, and members of the public on anti-aging issues. The disabilities caused by the human aging process are caused by physiological dysfunctions which in most cases are ameliorable to medical treatment, such that the human life span can be increased, and the quality of one’s life improved as one grows chronologically older. A4M intends to spread awareness about innovative science and research, as well as treatment modalities designed to prolong the human life span. The core of anti-aging medicine is based on scientific principles of comprehensive medical care encompassing those of many other specialties within healthcare. · Osteoarthritis (OA) is the most common form of arthritis and a major cause of pain and disability in adult individuals. Systemic inflammation observed in OA is partially reflective of local synovial inflammation. Common treatments for OA include agents for control of pain and inflammation, such as non-steroidal anti-inflammatory drugs, analgesics including opioids, locally administered corticosteroids and viscosupplementation. · Cellular therapy is an emerging modality for the treatment of OA. Administration of stem cells with anti-inflammatory function may be effective at preventing or delaying OA if delivered at early stages in the disease process. Human umbilical cord stem cell therapy is safe and effective for articular cartilage regeneration in patients with osteoarthritic knees. · BHI Therapeutic Sciences is planning to submit an Investigator-led, research only Investigational New Drug (IND) application for the use of FDA-approved cell therapy (Hematopoietic Progenitor Cells (HPC), cord blood) in the treatment of osteoarthritis. This prospective, open-label, single-center, exploratory clinical study will be designed to characterize the safety and efficacy profile of HPC, cord blood, when administered by intra-articular injection and intravenous infusion, in subjects with OA. BHI Therapeutic Sciences (BHITS), a leader in stem cell therapy and research utilizing human umbilical cord blood, announced today that the company has been notified by the Food and Drug Administration (FDA) that its Investigational New Drug (IND) application to allow for the initiation of a clinical study of an FDA-approved cell therapy (HCP, cord blood) for treatment of acute ischemic stroke may proceed. Phase 1/2 Study entitled “Evaluation of the Safety and Efficacy of Hemacord HPC, Cord Blood in Subjects with Acute Ischemic Stroke” is a prospective, open-label, single-center, exploratory clinical study that is designed to characterize the safety and efficacy profile of HCP, cord blood, when administered by intravenous infusion and intrathecal injection, in 10 subjects who have sustained an acute ischemic stroke. “Stroke is a leading cause of adult disability worldwide and the second highest cause of death in the world. To date, there are no clinically effective pharmacotherapies that can promote cellular functional recovery after an ischemic stroke. Human umbilical cord blood cell therapy is a promising treatment for ischemic stroke,” said Brian Mehling, M.D., chief medical officer of BHITS. “Stem cell therapy is an exciting, innovative method for the management and treatment of multiple medical conditions. We offer a unique concept that combines treatment and research,” he added. BHITS will support other follow-on indications using umbilical cord derived stem cells for treatment of traumatic brain injury, including chronic traumatic encephalopathy. Chronic Traumatic Encephalopathy is a neurodegenerative disease that is found in people with multiple head injuries. It afflicts players in the National Football League. NFL players have committed suicide as a result of the disease. The NFL has set aside nearly $800 million to treat it, but there is currently no treatment. BHITS will also be approaching the NHL and their player’s union. BHITS intends to develop human umbilical cord-derived mesenchymal stem cell product based therapies for use in IND Phase 1 clinical trials in order to extend lifespans and improve the quality of life for patients. In collaboration with local partners in Slovakia and China, BHITS’ sister company, Blue Horizon International has conducted several clinical investigations. Research subjects with chronic inflammation, musculoskeletal conditions, stroke and spinal cord injury were enrolled in our research studies and successfully treated with the application of human umbilical cord blood cells. In Slovakia, we are working on new clinical protocols (Parkinson’s disease, retinal and optic nerve diseases etc.) and planning to enroll research subjects in our existing and new research studies. Dr. Mehling’s research has been published in both national and international scientific journals including International Journal of Medical, Health, Biomedical, Bioengineering, and Pharmaceutical Engineering and Stem Cell Research and Therapy. 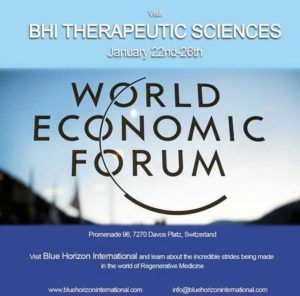 BHI Therapeutic Sciences attended the World Economic Forum in Davos, Switzerland. The 2018 World Economic Forum (WEF) in Davos explored the ideas, innovations and discoveries that are reshaping our world by working closely with those in the vanguard of change from such fields as the arts, culture, engineering, media, medicine, science, and technology. 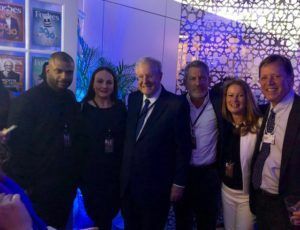 Relations; and Manuel McDonald, International Consultant attended the annual meeting and participated in conversations, networking events, and attended sessions and panel discussions. This is the sixth year, the organization sent representatives to the meeting. Founder of Global Dignity; H.R.H. Crown Princess Mette-Marit; Kofi Annan, former Secretary-General of the United Nations and co-recipient of the 2001 Nobel Peace Prize; Malcolm Stevenson “Steve” Forbes Jr., Editor-in- Chief of Forbes Media; Moira Forbes, EVP at Forbes Media/ Publisher, Forbes Woman; singer, songwriter, dancer and actor Usher; and many CEO’s, Fortune 500 companies C-level executives and government representatives. performed 3000 stem cell treatment procedures on more than 1000 patients. BHITS has conducted several clinical studies testing the safety and efficacy of human umbilical cord blood (hUCB) stem cells. Our clinical studies have provide support for the short and long-term safety of hUCB stem cells for therapy of different medical conditions, including chronic inflammation, musculoskeletal conditions, stroke and spinal cord injury. Our intent is to develop hUCB product based therapies in Investigational New Drug Phase 1 clinical trials in order to extend lifespans and improve the quality of life for patients. Dr. Mehling explained what stem cells could mean to global health, and how it is creating a future in which many chronic conditions and diseases will be managed with stem cells rather than allopathic medicine or traditional medicine. “Stem cell treatments are, without a doubt, the future of medicine.” Dr. Mehling states. “It is very important that people making decision on what direction the world will take in regards to research and medical treatments, are educated about not only the possibilities in stem cell research but also about all the treatments that are already available for many patients with different chronic conditions, ” he added. “By strategically placing our clinic in Slovakia, the heart of Europe, the most innovative research and treatments within the stem cell field is available for the global markets, just 45 minutes away from Vienna International airport, “ said Ms. Novakova. The theme of this year’s meeting was “Creating a Shared Future in a Fractured World.” It was the first time that the forum&#39;s annual meeting featured an all-female panel of co-chairs. BHI Therapeutic Sciences is pioneering ethical, effective, safe and affordable stem cell treatment therapies utilizing cord blood stem cells (those that are harvesting from an umbilical cord in the case of a C-Section, bringing no injury or risk to mother or baby). without drugs or surgery, treating the leading diseases and injuries shortening our life spans and causing millions of people to live in chronic pain. Stem Cells: The Next Frontier documentary screening for investors in NYC. BHI Therapeutic Sciences (BHITS) and Brian Mehling, M.D. hosted a private screening of Stem Cells: The Next Frontier on Tuesday, February 13 in New York. The evening included a Q & A session and information on how to participate by becoming an investor to make these life-saving stem cells therapies more accessible to patients across the globe. “At BHITS, our philosophy is that stem cells are the future of medicine and we are excited to share our ideas with the general public and investors. BHITS is pioneering ethical, effective, safe and affordable stem cell treatment therapies utilizing cord blood stem cells (those that are harvested from an umbilical cord in the case of a C-Section, bringing no injury or risk to mother or baby),” said Dr. Mehling. “Stem cells are a unique kind of cell that can be used to regenerate the human body without drugs or surgery, treating the leading diseases and injuries shortening our life spans and causing millions of people to live in chronic pain,” he added. “BHITS has a treatment and research facility in Slovakia, as well as clinic facilities in China and Jamaica. Our medical and scientific teams have published research on the more than 3,000 stem cell treatments have been successfully performed in our clinics,” said Doreen Santora, chief executive officer of BHITS. Kirk Barton, a retired NFL player, attended the screening. Mr. Barton was a member of the Miami Dolphins, San Francisco 49ers, Cincinnati Bengals, Denver Broncos and a college standout at Ohio State University, sustaining many injuries during his football career. “It’s a demanding sport. I’ve torn my PCL, MCL, meniscus, shoulder etc. multiple times. I’ve done some research and I decided to try the stem cell therapy offered to me by Dr.Mehling at BHITS in Jamaica. It was like getting a new knee. I never felt better. I recommend it to ton of people because I believe in it,” he said. His Excellencey Peter Kmec, Ambassador Extraordinary and Plenipotentiary, who served as the Ambassador of Slovakia to the U.S. since September 2012 attended the documentary screening and shared his insight afterwards. “I was pleased to learn from Katarina Novakova, who spearheaded the BHITS activities in Slovakia, they’ve had more than 250 patients treated in their facility. I am proud of the company’s innovative approach and wish them success with their future endeavors in Slovakia,” said H.E. Ambassador Kmec. “Innovation is on the top of our current agenda as well. We created a Slovak-American Business and Innovation Council (SABIC) in 2016, through which we would like to channel projects linked to startups, innovation, research, and development and to deepen trade and investment between Slovakia and US. Our goal is to help improve the Slovak innovation ecosystem through bilateral cooperation and to bring Slovakia into the family of the most competitive economies,” he added. BHITS has conducted several clinical studies testing the safety and efficacy of human umbilical cord blood (hUCB) stem cells. Its clinical studies have provide support for the short and long-term safety of hUCB stem cells for therapy of different medical conditions, including chronic inflammation, musculoskeletal conditions, stroke and spinal cord injury. Its intent is to develop hUCB product-based therapies in Investigational New Drug Phase 1 clinical trials in order to extend lifespans and improve the quality of life for patients. BHITS is for looking for accredited investors. The offering can be requested by emailing invest@bhisciences.com.